Supporters of Puerto Rican activist group “Boricua Vota” (“A Puerto Rican Votes”) watch a show held as part of a voter registration drive in Orlando, Florida, in March. ORLANDO – When Juan Carlos Cuevas fled Puerto Rico last year, after Hurricane Maria ravaged the island, he may unwittingly have traded a fight with nature for a political battleground. Cuevas is among tens of thousands of Puerto Ricans whose migration to Florida, spurred by the devastating storm, may alter the outcome of upcoming national elections by tipping the state’s delicate political balance. As climate change and worsening disasters push more people from their homes, the human wave is creating unexpected ripples in many places. In Florida, a hurricane a thousand miles away could this year contribute to political upsets and be an early instance of a new kind of American tale: one where climate change, by uprooting voters, is reshaping electoral politics. Puerto Rico is still reeling from Hurricane Maria. The island’s worst natural disaster in nearly a century gutted homes, left hospitals flooded, and knocked out power to the island’s 3.4 million U.S. citizens, many of whom remain without electricity. Cuevas said that when the hurricane wrecked his food stand on the outskirts of the capital, San Juan, and the nearby bus station that gave him a steady stream of clients, he decided it was time to go. Last November, the 34-year-old and his family boarded a plane bound for Orlando, where they now live in a hotel while they consider their options. More than 135,000 Puerto Ricans relocated to the United States in the six months after Maria, according to a report published this month by the Center for Puerto Rican Studies at Hunter College in New York. Some 56,500 of them have moved to Florida, a destination long favored by Puerto Rican migrants, the study estimates. If they register and vote, they will add an additional element of political uncertainty in a state that has long been a battlefield between political parties, said Anthony Suarez, a former Florida state lawmaker of Puerto Rican descent. The Puerto Rican influx means that at least seven of 27 congressional seats in south and central Florida are now too close to call in elections coming later this year, Suarez and other political pundits say. Democrats need to pick up 24 seats nationwide to recapture control of the congressional House of Representatives in mid-term elections set for Nov. 6, with all 435 House seats up for grabs. About seven in 10 Puerto Rican voters polled in Florida on the eve of the 2016 U.S. elections said they would vote for Democratic candidates, according to a survey by polling firm Latino Decisions. Because Puerto Rico is a U.S. territory, islanders who stay at home cannot vote in U.S. congressional elections – but Puerto Ricans who relocate to the mainland gain that right. In the 7th congressional district, where Cuevas lives, recently arrived Puerto Ricans are already making political waves. Stephanie Murphy, a Democratic House Representative who won her seat in 2016 by a razor-thin margin in this historically Republican district, is vying for re-election in what is expected to be a close race, said Steve Schale, a Democratic political strategist. Puerto Ricans who have found refuge in the district after the hurricane add to a community whose support was key to Murphy’s last win, Schale said. Such relatively small shifts in the political balance could have a far bigger impact – potentially even on the next U.S. presidential elections, Suarez said. U.S. President Donald Trump carried Florida in the last elections by about 110,000 votes – and Florida has long been one of a handful of states where victory is often crucial for candidates aiming to take the White House. In 2000, a 537-vote advantage in Florida was what put former Republican President George W. Bush in office, after a contentious election recount gave him the narrowest of victories over Vice President Al Gore. Today, “the Latino community is being turned off” by Trump’s hardline rhetoric on immigration and his plans to build a wall along the country’s border with Mexico, Suarez said. “Despite the fact that Puerto Ricans are not immigrants, we sympathize greatly with that,” he said. But the role new migrants to Florida will play in upcoming elections depends in large part on how many are registered to vote, he said. 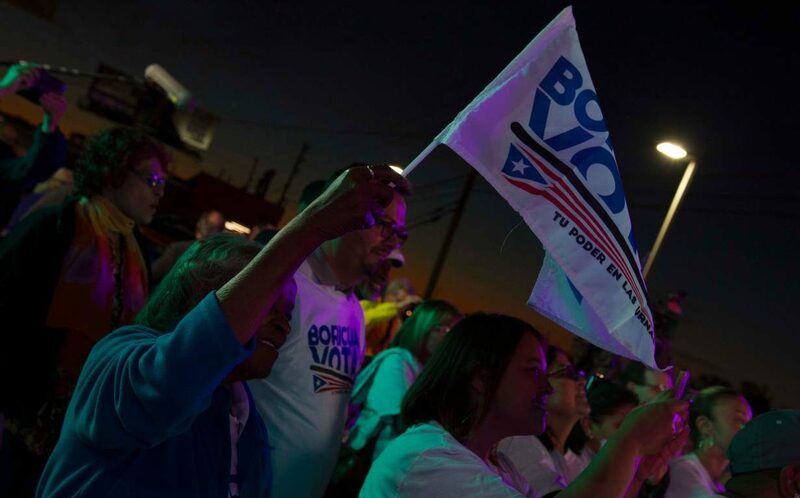 On a recent sunny afternoon, a group of Puerto Rican men gathered in the parking lot of an Orlando-area pharmacy and donned T-shirts with the inscription “Boricua Vota” (“A Puerto Rican Votes”). Musical instruments in hand, the volunteers set off to join a series of flash mobs around the neighborhood, part of a voter-registration drive in Democrat Murphy’s hotly contested 7th congressional district. “The elections are coming! If you want to achieve changes, Boricua, come out and vote,” the men sang, serenading amused clients in nail salons, barber shops and other businesses frequented by Puerto Ricans in a small strip mall. Volunteers carrying clipboards with voter registration forms followed behind. “We use music as much as we can to get people excited about voting,” said Jimmy Torres, the activist behind the initiative. Other groups are signing up newly arrived Puerto Ricans too. Mi Familia Vota and UnidosUS, advocacy groups that work on Latino issues and civic engagement, are leading the biggest drives to sign up Hispanic voters in Florida. They expect to register a combined total of 35,000 new Puerto Rican voters, their leaders said. “This is a population that should not be ignored,” said Esteban Garces, Mi Familia Vota’s director for Florida. For political scientist Nick Obradovich, the scramble to send Puerto Ricans to Florida’s voting booths may herald things to come in the United States as the global climate changes, bringing more extreme weather and potentially more displacement. “That is the sort of event that is more likely to occur in the future,” Obradovich told the Thomson Reuters Foundation. The researcher at the Massachusetts Institute of Technology is among a handful of scholars looking at how a warming climate is affecting the political process, including in the United States. In a study published last year in the journal Climate Change, Obradovich found incumbent politicians in 19 countries – including the United States – were less likely to get re-elected as temperatures increased and voters’ well-being declined. He believes the trend may eventually bring new risks for democracies. Voters may start kicking out politicians for being unable to fend off the spiraling effects of climate change – and that could push elected representatives who favor thoughtful, longer-term approaches to ditch them for populist, short-sighted policies, he said. “Especially at the more local levels (politicians) … only have so much that they can do in response to environmental stress,” he said.